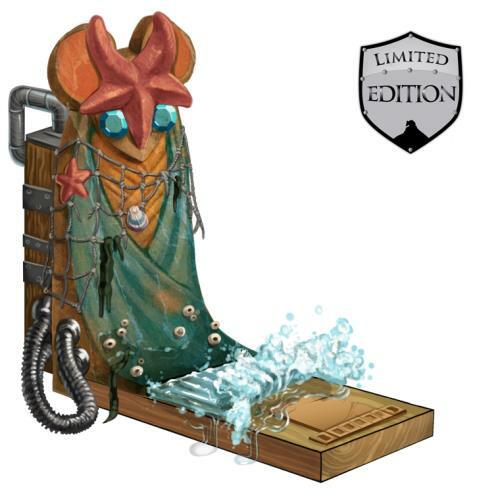 The Isle Idol Hydroplane Skin is a Limited Edition Trap Skin that was sold with the Limited Edition Isle Idol Trap. It changes the base trap's stats, power type, and area-specific effects when applied. Power: 3,500 Title Required: ?? Simple galoshes won't help here. The sheet of water rushing out of the bottom of this trap is powerful enough to knock over even the strongest of mice, so any mice attempting to steal cheese from this trap are advised to bring strong wading-poles and use the buddy system for safety. Any Elub mice washed away by the tide will also drop double the Seashells, which filter down through an ingenious collection system where they are sorted, categorized, and deposited directly into your inventory. The Isle Idol Hydroplane Skin is Limited Edition and can no longer be acquired by Hunters. It was obtained from the Isle Idol Box Set, which was available to be purchased for 1,250,000 gold from Ronza's Traveling Shoppe during Ronza's March 2013 visit. The box could be refunded for 750,000 gold at the same location, if left unopened. The Isle Idol Hydroplane Skinned Isle Idol Trap doubles the range of Seashells dropped (rather than the drops themselves) in Elub Shore. Therefore, if a mouse can normally drop 1 -3 loot, it will drop between 2 and 6 (odd numbers included) with the trap. Isle Idol Trap — Basic Physical weapon. Isle Idol Stakeshooter Skin — Converts Isle Idol Trap power type to Tactical. 7 March 2013: The Isle Idol Hydroplane Skin was introduced as part of MouseHunt's Fifth Birthday event. The Isle Idol skins are the first to alter the properties of a weapon. This page was last edited on 4 August 2016, at 12:56.